Western Digital subsidiary HGST announced today that it is shipping a 6TB hard disk drive with a twist: it's a hermetically sealed, helium-filled HDD.The new Ultrastar He6 drive is the world's highest capacity HDD with the best cost of ownership for cloud storage, massive scale-out environments, disk-to-disk backup, and replicated or RAID environments, according to HGST. "With ever-increasing pressures on corporate and cloud data centers to improve storage efficiencies and reduce costs, HGST is at the forefront delivering a revolutionary new solution that significantly improves data center TCO on virtually every level – capacity, power, cooling and storage density – all in the same 3.5-inch form factor," Brendan Collins, vice president of product marketing at HGST, said in a statement. "Not only is our new Ultrastar helium hard drive helping customers solve data center challenges today, our mainstream helium platform will serve as the future building block for new products and technologies moving forward." 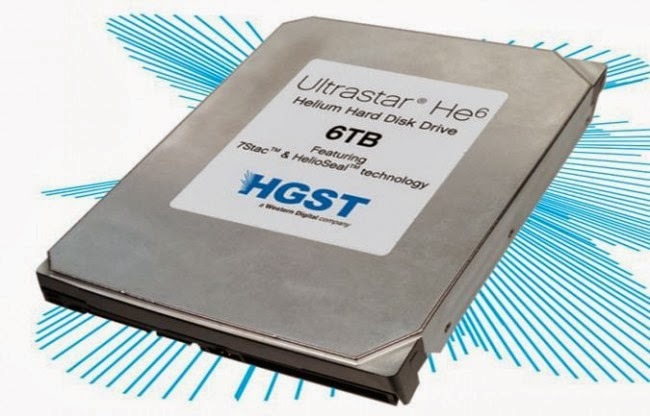 "HGST's helium platform will serve as the main platform for new technologies like shingled magnetic recording (SMR) and heat-assisted magnetic recording (HAMR) where HGST will continue to push the HDD areal density envelope," Western Digital said in its announcement. "The helium platform will also serve as the future building block for new, growing market segments such as cold storage, a space that HGST plans to address over the next couple of years." "Cold storage" refers to data that's needed only infrequently but that must be accessible relatively quickly -- not something like company e-mail archives and purchasing records that are dumped onto tape storage that's really slow but really cheap per byte. The Ultrastar He6 consumes 23 percent less power when idling than 4TB drives, WD said.